Their unique selection of open-ended activities for children encourages discovery and growth of imagination. Their specialty has always been to provide real, child-size tools to enable young children to have successful experiences learning how to care for themselves and their environment. They offer cooperative games and activities that are both educational and entertaining. Cooperative games - The For Small Hands catalog brings teachers and parents a comprehensive assortment of resources, from cooperative games and activities to books for both the classroom and home. The materials and products embrace a wide range of subjects from arts and crafts to music, world studies, eco-education, science, nature, and more. Find Montessori products including books, toys, games, and activities that are classified by age, for infants and toddlers to students up to 8 years of age. Materials & books - For Small Hands carries an extensive collection of books as well as premium educational materials that will help children grow, discover and explore the world around them. Invest in educational products and build a library of educational books for various reading levels. Art, science, geography and language books will help early learners improve their reading skills while they are introduced to a multitude of fascinating subjects. Older kids' games and activities - From interactive and cooperative learning games that help foster cooperation, to active play, puzzles, and fun family board games, the For Small Hands catalog features a fresh and exciting supply of kids' games and activities that will encourage all ages to play together. While exploring balance, form, shape, color, and size relationships, children will love the engaging games and activities, and find the child tested tools that are both practical and functional. Montessori toys - For Small Hands excels at providing real, child-size tools that enable youngsters to have successful experiences learning to care for themselves and their environment. Find a playful collection of Montessori toys that inspire creativity while teaching essential skills. The selection includes kitchen, cooking and baking tools, yard and garden items, child-sized cleaning tools and more products that are both educational and practical. 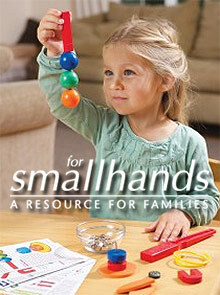 The For Small Hands catalog brings parents and educators a vast assortment of cooperative games and activities for the classroom, including open-ended activities for children that encourage discovery and growth of imagination. From toys to books that stimulate reading, you'll find tools and materials to help build a strong educational foundation for children of all ages.